If doubt is your middle name simple advice on how to deal with it in practical terms is very welcome. One discipline that focuses on exactly such practical advice is a branch of philosophy called argumentation theory. That in itself doesn’t mean much because academics thrive on jargon, and parade their intellectual superiority preferably on a professional stage that only attracts fellow artists as spectators. But when someone with that background acts in the general public domain it’s often worthwhile paying attention. Jean Wagemans who writes for one of the major Dutch dailies is one of those. Just two tidbits from recent pieces of his. The first describes in the simplest of terms what distinguishes the conspiracy theorist and the believer from a good scientist or medical doctor. All of them argue from an effect/symptom to its attributed cause(s), the former stick to finding more and more evidence for their pet cause, while the latter try to argue for a best-possible-explanation status for their pet cause by coming up with as many alternative causes as possible and then trying to show they can’t be it. Sure, this is Popper for dummies, but I am convinced that only by dumbing great insights down without distorting them one has any chance of getting to their essence; and any hope for them to make an impact. That a huge proportion of scientists and medical practitioners don’t follow Popper’s strategy in practice is a best indicator for the validity of this statement (don’t blame him for this one, it’s mine). The second is very much related in my book. It’s about what makes for a good debater. The crux of the matter says Wagemans is not putting your opinion against that of your opponent. It is refuting her opinion. And the best debater does this by using the arguments of his opponent. Using the war metaphor it would be fighting the battle on the enemy’s terrain and using his weapons. Systematically challenging the causal chain of one’s per theory from all possible angles and coming up with as many alternative causal chains and doing the same for them is sound practical advice for all us doubters. A major reason why I think The Spirit Level makes such a strong case for the importance of inequality in human affairs is exactly that. 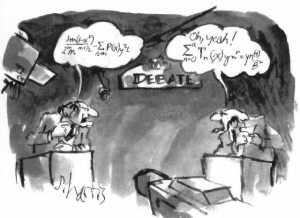 This entry was posted in psychology and tagged argumentation theory, debating skills, Inequality, Jean Wagemans, scientific thinking, The spirit level. Bookmark the permalink.